Toradora! was selected as a recommended work by the awards jury of the 13th Japan Media Arts Festival in 2009. The light novel was also adapted into video games for PlayStation Portable, published by Namco Bandai Games in 2009. I don't usually watch the romantic comedy genre of things. I always enjoyed action, fantasy, adventure like Soul Eater, Cowboy Bebop, Trigun etc. but for some reason I was in the mood for something different. Toradora is just the 3rd romcom anime series i watched and I can truly say that it has become my FAVORITE anime. -The story stays away from cliches and was relatively unpredictable for a love story. Every character had a reason and motive for what they did and how they acted, other than just being unnaturally dumb/too prideful/stubborn. Afterwards, I thought a lot about why an anime series of a genre that is usually not my taste could have been able to retain my attention for so long, and i realized the answers: the characters and the overall story. The characters are what make this series so great. Each character have personalities that are unique and rather realistic and believable (or as realistic as animes go). There is no "super" character that acts too good or too cool for school. There is no "that annoying" character that acts too snobby or stuck up, which can sometimes be a problem for tsundere characters. And this is all because every character shows a weak side or moments of insecurity, which makes each of them more relatable. It also allows for many rather comedic scenes as well as emotional moments. But the best part is the interactions and chemistry between all the characters, and the way each of them change as their relationship with each other grows. The second thing is the story. The reason I usually don't care for romance or drama is because I usually find the story too cliche or predictable. I also hate those cliche moments of "coincidence", for example, when a main character happens to see his/her love interest with someone else accidentally and misunderstands. I also hate it when characters act unnaturally stupid or too prideful for no reason and let it get in the way of the relationship. But none of those cliche moments happen in Toradora. Every character has a reason and motive for the actions they decide to take. The story managed to keep me guessing and wanting to know what will happen next, instead of making me feel like i could write the story myself. Another plus for Toradora is the music. There are some key scenes where the soundtrack actually triggered goosebumps and made me tear; it still does even after rewatching. THAT IS RARE FOR ME. In fact i don't think anything I've ever watched, not just anime, can even make me feel that emotionally invested in fictional characters. Almost forgot to mention that after it was done, I started to watch it again from the beginning the next day. Another rare occurrence for me, as usually i don't feel like rewatching things for months. I was able to pick up certain things that i missed with the first watch thru. The only reason I put the story as 9/10 was because of this. A few plot points weren't really shown or conveyed in the best way and were missed even to an avid viewer like me. But I was glad to have felt that way, leaving me thinking about what I missed, instead of feeling like I could have easily figured it out or seen it coming. Again, Toradora has become my favorite anime, as a guy that usually doesn't care for this genre, which says a lot. It gave me more enjoyment than any of the other anime I have seen so far. I would recommend it to anyone, not just romance lovers. This's the first time I got the "4 seasons" feeling while watching an entire anime show. 1st time: During episodes 1 to 2, watching those episodes for the first time I thought this series would just be a light comedy anime which will make me chuckle without a complicated story. It just like the spring season that give a high hopes on the early year. 2nd time: During episodes 3 to 14, I'm getting a bit bored and almost drop it, but I decided to push my self to finish it (the only reasons I want to finish it is just because I got interest by the last main character who showed up in this part). It just like summer season that is really hot, and the only fun is going to beach during the summer break. 3rd time: During episodes 15 to 24, my curiosity was piqued for what will be going on with this show, things got a bit complicated, and I think this part is the "life" of the series. Just like an autumn season, although the flowers fall, but becomes a wonderful scenery. 4th time: During the final episode, "WHAT THE HELL", with this final episode, I mean everything seems fine at the beginning of the episode, but in the end it turned out anti-climatic for me. Just like the winter season, unpredictable storms, snow, and always cold; but after that Spring comes. Well, that's my personal view of the story, so I give 7/10 for it. Art and Sound, nothing particular to comment, it all seem good enough, and I like the second opening OST. 7/10 for both of it. All characters were unique, both in design and personalities, even with the supporting characters, they are all really good. A great job was done by the creator at this point. EXCEPT for MC's pet, it's very annoying, and I really like "Ami-n", her appearance, her personality, her reactions, her way of pretending to be an adult (she's the last MC that I mentioned before), so 8/10 For Chara design. For the enjoyment, I think I'll go for 7/10 that because this show had me feel bored once, and the ending was anti-climatic for me, but I do like the humor and story development (starting from episode 15). Overall 7/10 score for this show. Romance has always been a tricky, unforgiving genre; you make one mistake and the story slowly begins to crumble. Why is that? Well, as many of us may know, love is a complicated business. So is entertainment. So why do we watch romantic series? There's many different answers that vary based on the individual. Maybe we're simply taking a chance at trying to find a feeling. A feeling of the tingle of our heartstrings, or a stir in our human emotions. It's good to feel these things from time to time. Fortunately for us, Toradora is a series that gracefully grants us this chance. It captivates us in remembering what a romance series should strive to be. What makes Toradora so exceptional as far as the romance genre goes? Is it the story? The art? The Sound? The Characters? It just may be all of them combined. I'd like to begin by stating something. The story of Toradora is very predictable. Cliché even. But wait, isn't that a bad thing? While the story may seem plain, the execution of the pacing is undeniably good at assuming a calm, relaxed flow for the majority of its run which, in turn, yields a satisfying romantic series as a result. Toradora is not like many other romantic series out there that have characters fall in love simply just because. Love slowly stems from what begins as two people who become friends looking for mutual assistance in their romantic interests. Toradora gives its audience room to breathe and focuses the first half of the show on building the friendship between the two main characters through silly, lighthearted antics, making developed romantic feelings between characters seem more realistic and sincere later down the line when things become more serious. However, love is a complicated business, as I've said in my introduction. People's feelings do get walked over and left in the dust. While it's thematically a good thing for the audience to feel touched emotionally, seeing characters getting their emotions crushed was truly a somber sight to behold. The art was smooth and was enjoyable visually. I did like the consistency that Toradora’s animation offered. For a series that was done in the 2008-2009 time period, it still looks marvelous and holds its own compared to more recent anime. The sound was a big plus in my book. While I liked both the OPs and EDs, I have to give a big shout out to the timing of the music during dramatic moments; that repetitive melody of piano left quite a strong impression on me. I'd like to also address that the script and voice actors were really quite something. The dark little subtleties in comments or remarks were an admirable feature the show had to offer. I think every romantic series heavily depends on its cast to be the foundation of the series, holding the structure of the show into place. The characters of Toradora are an interesting bunch that create the opportunity for its audience to laugh and also feel gloomy. There is more than meets the eye underneath these seemingly cliché characters. Ryuuji is the male lead and he is generally a very likable, realistic character. He struggles with romance, gets low self-esteem because he’s self-conscious, and regularly voices his opinions on matters at hand. Throughout the show he proves that he’s a loyal friend and all around good guy, though he might be a little obsessive compulsive about cleanliness and order. But hey, who doesn't have their own little quirks? Moving onto the main female lead, I felt a little wishy-washy in regards to liking Taiga’s character. I’m not a fan of the tsundere type, and that’s exactly what she is. While Taiga acts like a brat most of the time, she also becomes more and more endearing as the series progresses. She stands up for herself and her friends, and despite her childish behavior, generally cares for the people around her. With the main two characters out of the way, what about the other ‘main’ characters: Minori, Yuusaku, and Ami? One of Toradora’s strengths was allowing the supporting characters to have their moments in the spotlight. Because of this, we are able to obtain a deeper understanding of them and paint a better picture of them as characters. While Ami and Minori seem perceptive of the relationships in the group, I’m honestly not sure about Yuusaku. Under his oblivious façade it’s somewhat difficult to tell. While he's Ryuuji's best friend, he is oddly quite different compared to him. Yuusaku is energetic, outgoing, responsible, yet also very silly and childish. Minori seems like genuinely a nice girl with the happy on the outside cliché personality, but Minori is really a coward underneath it all; she doesn’t confront her own emotions and constantly pushes for Taiga’s happiness at her own expense. It’s not that I disliked Minori as a character, it was just agitating to watch her at times. Last but not least, Kawashima, Ami. Ami is the most astute of the unsaid troubles that are bothering the people in the group and often makes subtle comments or sarcastic remarks pertaining to their unspoken feelings. When she is first introduced she seems extremely stuck up and vain, but as the series progressed it becomes more apparent that she’s tactfully looking out for the people she can finally call ‘friends’ for the first time. She developed the most out of the three supporting main characters, in my opinion, and easily became one of my favorite characters of the series, if not my most favorite. Despite how gratifying I thought the series was, I also can’t turn a blind eye on the aspects of the show that I did not like. One of the most annoying tropes in anime, at least for me, is characters getting hit for no reason, or very petty ones. It's a trope that comes hand-in-hand with the tsundere character archetype, and it's one of the reasons I dislike tsundere characters as a whole. Taiga, who basically goes down the list of tsundere character traits like a check list, is a huge offender of verbally and physically abusing Ryuuji early on in the series. If you're like me, you'll find this to be quite vexing. Lastly, fan service is apparent in nearly every recent anime. While I personally dislike fan service, I know that many series utilize it to keep a portion of their audience interested. I watched Toradora because it was a romance story that set itself apart from most others. Although it's substantially toned down, comparatively to other series, I believe Toradora would have been better off not utilizing any fan service at all. While I did like the ending overall because it ties things up nicely, and felt fairly rewarding, I did not like how the ending felt very rushed. The amount of material crammed into the last couple episodes felt considerably off, considering the rest of the show was focused on coaxing the relationships at a much slower pace. A couple bad apples on a tree don’t make the rest of the apples rotten, and Toradora was far from being bad. It isn’t a completely perfect series, but one of the best the romance genre has to offer in anime so far. Every once in a while a person can't help but wonder what if. There has been a time in all our lives when we have pondered the thought of meeting the 'one' who is exactly right for us. Every day we strive to find a person, or people, who understand and accept us for who we are. Maybe, just maybe, you’ll find that one person that fits together with you like two consecutive cogs in an intricate machine. Maybe, if you were lucky, you might meet someone who is exactly right for you. It's not because this person is perfect, or because you are, but because your combined flaws fit together seamlessly in a way that allows two different beings to coexist together perfectly as equals … something like a Tiger and a Dragon. 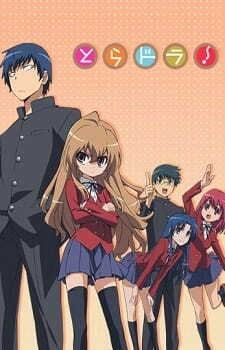 Toradora!= Another normal romance/drama anime involving high school...We had many anime of this kind. In fact, these type of anime are very common nowadays. I had watched this type many times, but mostly ended up so wrongly. Story- Involves a ordinary guy named Ryuuji Takasu and a short and short-tempered girl named Aisaka Taiga. This reminds of Saito and Louise from the Zero no Tsukaima series. Where the protagonist always gets beaten up by the girl, yeah those type. And more strangely, most of these short anime girls are always so strong or feared by many..thats Taiga a.k.a Palmtop Tiger. While Ryuuji only looks scary, but in reality, he's pretty harmless. OK~ enough of that...Why only a 7 for the story? Its pretty common..and its very predictable. I knew Ryuuji would end up with Taiga even just by looking at the cover art without watching the anime!. So obvious, so predictable, which makes it a bit boring. This flaw is common in many romance/drama anime, but its quite annoying. Story have a very good pace but it took quite a while for both of the hero and heroine to fall in love. Yup, they fell in love...but it took so long! But that's a good thing right? haahha- well~ those are the flaws I found here. Story= 7 out of 10. Art- Graphics are rather unusual but very good..which I would say, Graphics are unique, that's for sure. Good graphics should receive a good score! Art= 9 out of 10. Sound= 9 out of 10. Character- All characters are uniquely made...Yup, especially Taiga and Minori. Minori had a very funny attitude which I loved. Awesome characters, awesome score. Character= 10 out of 10. Enjoyment- I enjoyed every single episode there was, some were very memorable but few are forgettable. I personally, enjoyed every minute of the anime which included comedy, parodies, romance, and some parts were very sad. Sad, but not as sad as Ef- Tale of memories. Toradora! can make you have "watery eyes", but Ef probably can make you cry. Beyond Awesome enjoyment. Enjoyment= 10 out of 10. Overall= Toradora! is not really recommended for everyone to watch, but Its highly recommended for fans of Romance/drama/comedy anime with a bit of sadness. If you bought it, its worth every penny. Anyone looking for some romance, then this could be your answer to that question. If you watch it online, its worth every minute and if you downloaded it, its worth every bits of data. OVERALL= 10 out of 10. Really loved it. Japan's culture of Christmas is quite unique compared to the Western world, both in real life and in fiction.